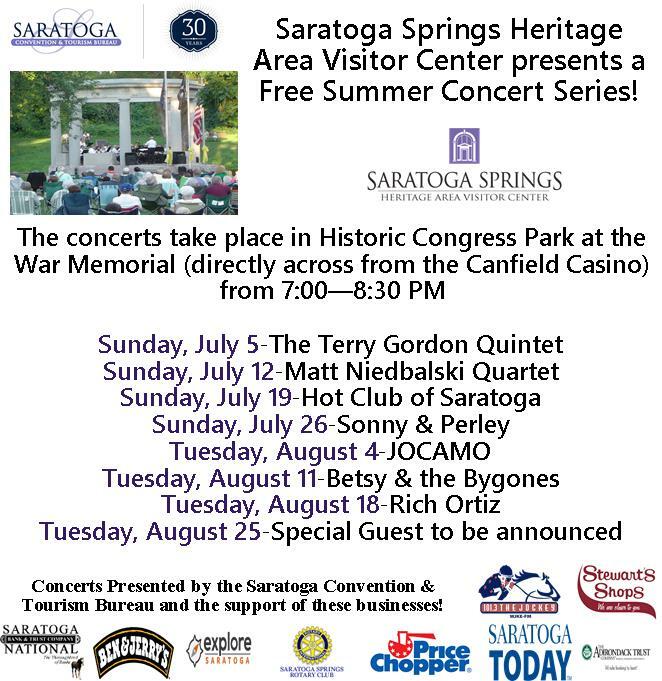 SARATOGA SPRINGS, N.Y. – The Saratoga Convention and Tourism Bureau will be presenting the Visitor Center free summer concert series in Congress Park in July and August. Saratoga Convention & Tourism Bureau is a key economic development engine for this community, the mission of the Saratoga Convention & Tourism Bureau is to contribute a positive impact on the local economy by promoting and marketing Saratoga Springs and Saratoga County as a world-class destination for meetings, conventions and groups. For information on how to schedule or plan a meeting, conference, wedding or sport/special event in Saratoga, visit the Saratoga Convention and Tourism Bureau’s website at www.discoversaratoga.org.